Whether you are beginner or very good skier, the Tempo Dualski will answer to all your sollicitations and will be your partner for years. The Tempo Dualski is intended to people who have a lower limb disability. It allows skiing independently with remarkable performances like the best able-bodied skiers. It is much more than a biski. Easy to ski, it is quickly handled and allows a fast improvement. The fully suspended frame allows skiing efficiently and it will completely satisfy experienced skiers. If you are looking for an easy sitski without limiting your desire to escape, the Tempo Dualski is made for you. 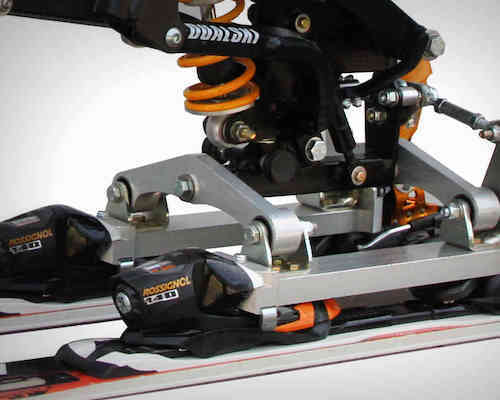 Efficient – The suspension movement and the specially designed Öhlins shock absorber offer an excellent ski / snow contact. Versatile – The Tempo Uniski helps you to improve yourself. You will enjoy whatever the conditions of snow and slope. Easy – 2 strong gas jacks help you to rise up for the chairlift without any efforts. Taking the chairlift becomes a child’s play !